Oh. I get it now. It's September. I have pumpkin vines on my pumpkin plants, but no fruit. I really doubt that I'll have pumpkins by Fall! I really do! Oh well, it's always fun to try! Lately, my bird feeders hang full for days on end with no visitors. I guess it's proper for me to be thankful this season while the birds celebrate their feast. It comes a bit earlier than ours. They don't need us, right now. They are off eating plenty of berries, fruits, and seeds in the surrounding forest. It truly is their Thanksgiving. I just feel a little lonely, is all. I miss my goldfinch, my purple finch, and oh, my beautiful grosbeak! I don't have to make hummingbird juice twice a day, either. I should be happy, but... I miss it! I miss my baby hummies! They were so fun to watch being taught how to eat by their parents! Summer is wrapping up. I'm afraid if it weren't for the chance of rain and my excitement over a rush of searrun cutts up the river, I'd probably fall into a depression. This time of year is just too still, too calm, too eerie. I don't suppose the lasting memory of 911 helps, either. That day, I went out to pick blackberries, as I needed a break from the television news. It was hot, dry, and still out that day, and it's forever fixed in my memory. Yesterday the East wind blew strong. The maple leaves were racing down from their trees, and now have covered the river bottom with a patchwork quilt. If I pointed into the wind, I could cast for miles. I had a great time, although the old East Wind rumor proved true, and I could not buy a bite! 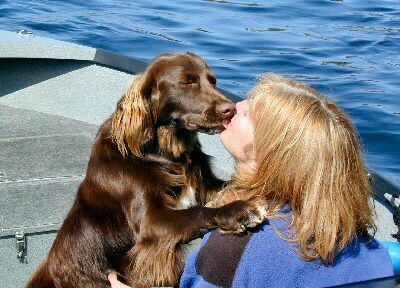 My Kilchy-My-Cuteso fishing with me. What better fishing bud can you wish for? Yesterday I heard that Ryan received his cake in the tube! 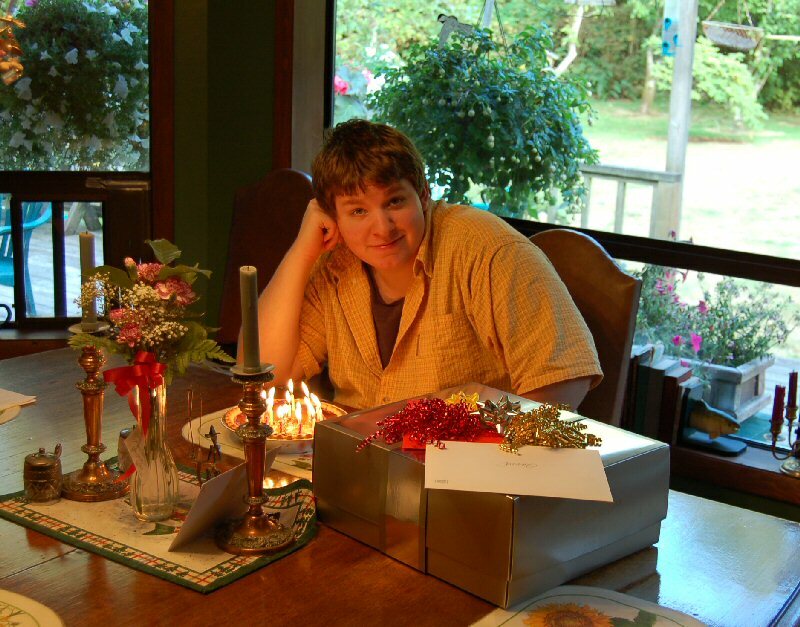 It was long time ifish member's "Ryan Pultz" Birthday on Ifishstock Day. He had asked that we make him a Birthday Cake for the celebration. I was so busy! However, guilt got the best of me, and at nearly midnight, the night before Ifishstock, I was helping bake him a cake. He didn't show up! I couldn't believe that! And found out the next day that he was pulling anchor with a friend, on the river, even though his excuse was that he pulled a groin muscle. How dare him! So, laughingly and lovingly, we took that chocolate cake, stuffed it in a zip lock baggy, played a little Volleyball with it, and mailed it in the mail to him in a padded envelope. Gogurt chocolate cake in a tube! Ryan had fun with that joke, and so did we! He has a great sense of humor, and we knew it. I'm glad that he took it well. My Bill commented, "Isn't that kind of mean?" That spooked me a bit. I wondered! Was it? But, I thought I knew Ryan well enough. He holds his own pretty well. And, after all, who can resist a day on the river on your Birthday? Ifishstock is fun, but hey! We have our priorities!!! We fished the Nehalem a couple days ago. It is that odd season between where the summer chinook have mostly gone up, and the Fall Chinook haven't arrived. The river was quiet. Maybe a dozen boats, and no fish caught! However, the sun was shining and it was one of those nice days for a boat ride! I came home to finish cooking a pulled pork. Pork roast on the Traeger for 18 hours is really yummy. Oh, the kids loved it! I think we are going to Memaloose this morning to see what we can see. I'll report back. Have a great day. Enjoy the season, and if you have this weekend off, I hope you have a wonderful, relaxing time. Get Outdoors! --and do be careful! I've yet to come up with a solution and frankly, it's really scary! My knot tying is comparatively awful. I can't see at all out of my left eye, now, and it frustrates me to no end. Not only that, but I'm stubborn. Sure, Bill will tie it for me. But, I won't let him. I've got to do it, myself... somehow! There has GOT to be a way. If I'm by myself, just what will I do? I've got to plan for the future. If I give up and have Bill do it, I'll never figure it out. I can't buy pre tied flies on line! I can't buy a tippet pre tied to my line, for gosh sakes! As long as Bill is around, I'm fine, but what if I'm alone? I've tried magnifying devices, but the problem is that I see double and triple. Magnifying duplicates of things just makes it worse. I'm forever envious of people that can tie on fly after fly, and especially at dusk! I'm sure my fishing would improve if I were able to change flies as often as the hatch changes. But, I just fish with flies that work often. I've found that a Spruce fly will work most of the time on the Kilchis. So do brightly colored 'anythings'! One thing' it's hard to tie 'sightless' if you have calluses on your fingers. You have to be able to feel even the slightest piece of leader off your fly. So, I take a pumice stone to my fingers in the bath, to make sure my fingers are tender and soft. There will be no poking leader sticking out on my flies! No sir! What I can't do, though, is tie on a new tippet. You know, tie one line to another. Can not do! So, the other other night I noticed I only had 6-8 inches of leader left. Not good for low and clear. Not good at all! Each time I cut off a fly and tie on another, I lose a bit of leader and I know that the time is nearing. That terrible time when I need to tie on a new one. My first thought is, "Bill! Help!" But NO! I won't do it! I was so frustrated. I had tool after tool that I had been given, trying to perform the task with my eyes closed, just to prepare for a future that I very well may soon have to deal with. It's bad enough, now. If it gets any worse, I'll be there. I do not like this helpless feeling. I do not like it one bit. But, I will deal with it! I can see distances without the double vision, but close up, it's just awful. I sat and stared at the ends of my line, of which there appeared to be at least 15! It's so frustrating! A blood knot is difficult to tie, anyway.. but with duplicates of 15, it is impossible! I lost my patience, tossed down the line, the straws, the tools, and I went to grab my other fly rod, of which I had at least a foot of leader left. Bill kept saying, "Jennie, let me do it!" But, Jennie would not! I pulled my rod down from the rack. "For tonight, this will have to do." Leaving my frustration behind, I lay the other rod down, and left my tippet less fly line strewn carelessly over the picnic table. I walked down to the river to fish. My mind was still racing with ideas, but I tried to hush them with each cast. I closed my eyes during the cast, and opened them just as my fly landed. It landed the perfect distance, and laid out beautifully quiet. Ah... I can do this, blind or not, like a pro! It was just the other day that I sat on the rocks in tears. I was having a spell of not seeing well at all. There are times when my sight clouds over, and black spots fill my field of vision. My doctor calls it an ocular migraine. I call it hell. I was with Bill, and I thought I could fish, anyhow. Knowing I couldn't see and that I needed to rely on my other senses, I first went through the process in my mind. After I'd practiced in my mind, I began. I did OK the first cast, and began the retrieve. Ah! Success! No fish, but a perfect cast and retrieve! But, on the next, during the back swing, my hook caught a rock and let go, resulting in a mass of tangled leader. I retrieved it and held the mass of tangled line in front of my face, and the two single loop knots appeared to me to be a thousand circles of messed mono. As I stared at it, I began to cry like a baby! I was so frustrated! I failed the braille fishing test! I hadn't wanted Bill to see me, so I grabbed my walking stick, and tried to head back home before I was caught. He yelled at me to stay, but I kept on, like I didn't hear him. I made it over the rocks, and began to try to follow the shaded tree line to the trail. Do you know how similar the shaded tree line looks, when you have only light and dark to guide you? I could not find the trail! I was walking into tree limbs! I began to panic, but just then, Kilchis came to my rescue and headed up into the trees. I followed, and sure enough, it was the trail! Thank you, Kilchis! I had made it home! It is possible, and I will find a way, a tool, something to help me tie those tippets to my mainline. And the other night? When I left my tangled failure of line on the picnic table? Well, when I got back, my rod, my line, my mess was all gone! Confused, I walked into the house, and there was my rod, with all of the other rods, hanging neatly where they always are. And on the end of my fly line was a neatly tied brand new tippet and leader. Bill couldn't help himself, and you know? I wasn't upset. It was beautiful, and so much better than I could ever do! Thank you, Bill! I really don't know what I would do, without you! Ever heard of Mom running away? Well, I did! I had just had it! So, since I had to go to Portland anyhow, and I had been putting it off, anyhow, one evening before dinner, I just got in the car and ran away! I had a blast, even though I left being very upset with our oldest, Roo. We'll get past it. It's just one of those separating from the home things. Such a difficult time for a young guy, 19 years old, trying to break out, be independent, and find his way. I don't envy him this age. I do, however, have pity for me. So, that pity took the form in running away! I had a wonderful time! 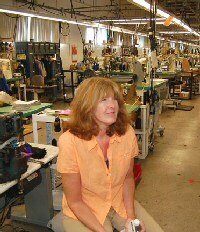 Among other business ventures, I toured the Danner Factory and had a great time doing it! More on that, later, but here's a picture to get started! I was in boot heaven! I also spent some time on a conference call with the folks putting together Fin Fest. I've been doing alot of thinking on that one. It's no secret that I had a very close brush with death not long ago. In listening to a biography of our recently lost wildlife hero, Steve Irwin, I heard him say something to the effect that he wanted to share his love for wildlife with people so that they would be inclined to save them. People want to "save" what they love, and if there was one thing he wanted to be remembered by, it was his love for wildlife. Well, I'm going to say it right now. What better time? None of us know when the time will come, so... I want to be remembered, if I could, please, by how much I love fish. I want to share my love of fishing with you. I want to share with you my close encounters with fish, whether it may be when they rub up against my hip boots while wading in the Kilchis, or glancing over the edge of a small boat in crystal clear waters, and catching a glimpse of a large salmon swimming upstream! May it be the powerful struggle of having a fish on the end of my line, and reaching over to touch it's soft, silvery sides before I release it, or the intense giggles of a searrun cutthroat trout on my fly line, doing cartwheels and flashing it's sides in the summer sun. You know, I've built a successful web site on fishing. But, so what? If we don't do anything with it, it's all for folly. I'm not saying that ifish hasn't done anything good. We have. We have built a way to communicate with other fishers, and I'm pleased as punch to see that official governmental agencies use it to spread the news on what we need to know. We have a connection, now, and that is all good. However... we have a problem, and it needs to be addressed NOW. Ifish will be all for naught if we don't save our salmon. The time is NOW if it's not too late to do that. What will ifish be, if we don't have any fish to be "ifishing" for? And so on my conference call with all of the folks involved with the Fin Fest, where David Duncan of "The River Why" will be speaking, it occurred to me that we have a responsibility that we are not even coming close to fulfilling. From this point forward, I will be working to impress on people the need to save our salmon. I have so much to learn! So much to do! And so do you! This is our responsibility! It's exciting, really, that if it's not too late, we are the chosen people to save the salmon! We are their last chance, their last hope for survival. So, if you'll come to Fin Fest with me, I've been guaranteed that we'll learn how important our collective voice is. Right now, I can't tell you how we are going to do it, but I'm sure we'll all learn together how to take that first step towards saving our wild salmon. We already have a way to keep connected. That is ifish.net. Now, let's use ifish to do something really positive with our lives. I want to be remembered for my passion for salmon, for our rivers, and our streams! My strongest wish is to know that before I go, I did something important to save them for future generations. I don't want to be remembered for starting a silly web site, unless it accomplishes something that we can all be really proud of! I'm starting right now. I'm doing all I can to prepare for a wonderful beginning on September 19th, 2006. If you feel like I do, please, please, please... join us! ...and then, a silver white fringe met the otherwise deep blue skies over the coast range. Overhead, clouds gathered, all lacy at the ridge, teasing, and then weaving together, until it finally covered the sky from mountaintop to mountaintop. Soon, a moisture was felt in the air, and the great towering evergreen tree tops became wet with rain. The threat of fire was finally dampened. A muted "shhhhh" filled the valley as the rain poured from the clouds, in torrents. It was muffled by the thick leaves in the trees that canopied their brittle wooden frames. A few came crashing down with the sudden weight. All summer long, they had blown lightly in the warm breezes, carefree, lightly, caressing young lovers having their picnic lunches. The river banks soaked with the moisture until it could hold no more, and the river itself began to grow deeper, and wider.. until it crawled slowly up the sands, wetting the base of the blackberry bushes, removing any trace of summer trails left by campers, sun bathers and other summer recreationalists. Meanwhile, no one was listening. No one was paying attention, but all the way down the river and into the sea, they could smell it... and they began to grow restless. They came, first by ones, then by pairs, and finally whole schools of anadramous fish caught a whiff and followed their senses, home. Home, home, home... it drove them without their knowing why. They crossed the bars, dodging divers, and planers and hooks, oh my! Running into lines, thick from the boats above, dodging seaweed that hung from them, the fish are almost to their destiny! The fishermen, crazed by the storm and predicting their run, rocked in the suddenly angry jaws of the bay. Reeling in to clean their lines every five minutes, trying desperately to fool the fish with herring, spinners, eggs! But still, they followed their noses and that strong internal drive that said to the salmon, "go forth, sisters and brothers(!) and spawn!" Stan wrote a column, and it's up! Go read it, now! It just may improve your catch rate! He's sure got me thinking! Yesterday, my immediate family got together to do something we had promised we would do, a long time ago. When my Mother was dying of cancer, she sat down with the girls and helped us label the family keepsakes. All the stories behind thing, articles, jewelry and dishes. Then, we made a list of all the grandchildren, and what she'd like to go to whom. That list never was finished, but it was interesting to go through. We all gathered at my Dad's house in Canby last night, and brought out the chests that contained the treasures. Oh! The things that I found! You know, as we get older, we aren't so apt to collect "things". It is my season to rid my house of "things", not to collect! So, although many things touched my heart, I was able to turn down taking home many of the things that I once would have nabbed up in seconds! There was one item, however, that I could not leave behind. That item was our family popcorn bowl. Old, wooden, cracked, barely useable, but... it's now mine! I love that bowl! That wooden popcorn bowl sat in front of five leggy children every Sunday night as we gathered to watch Walt Disney. It was huge, back then, but I think it shrunk! Still, it's mine all mine and I'll never let it go! Somehow, I thought that we had sold it at the estate sale, but no!!! I found it! YAY! Oh! There were so many wonderful things, though! Also treasured is a 1935 edition of the Sunday Oregonian in perfect shape, that has Tabitha Brown pictured full length, on the front! You would not believe the condition of this paper. Like brand new! Tabitha Brown is my great (how many!?) Grandmother. She founded Pacific University. There were also some of the original scrolls of her diary, kept while crossing the Oregon Trail. Click here for her biography. I couldn't help but bring home a box of papers from my Grandfather, Roy Davidson. He, of course was my favorite Grandpa, and an avid fisherman. Mr. Davidson wrote several articles that were published. Some were published by Field and Stream and other popular magazines. I do believe that in the box that I'm going to go through, today, there are some of the original drafts of these articles! I can't wait to sort through them! Also, a 1900's Lewis and Clark Centennial poster, a 1856 high school diploma from Forest Grove High School, pictures from a trip to the Holy Land around 1850!!! Pictures of Pompeii, Mt. Vesuvius, Jerusalem! Cool stuff, man! OK! Now I can't wait! It's off to shower, and on to sorting and reading what's in the magic box. Alright, so I did bring home some other trinkets that brought tears of nostalgia to my eyes.. A candle holder, an olive spoon, unique things that just remind me so much of home, of special dinners, special times, sitting around my Grandmother's table during the Holidays. But... my popcorn bowl. Cracked almost clear through! Oh... the butter in the bottom of the bowl! The last handful! Having someone return it to the kitchen for more butter, more salt, more popcorn! Of course, back then popcorn was made only on the stove! None of this air popped stuff. I had to go buy some kernels to make it that way. And tonight? Tonight we are going to have real popcorn and we are going to explore the mystery box. I can't wait! Can you imagine if I find Grandpas articles from Field and Stream? I've been searching my entire life! The year of no fishing. There is a certain sweetness to sameness, a beauty in boredom. Yesterday was one of those days, or at least started out to be. I didn't have much to do. We were going to go fishing after my appointment at 7 in the morning, but found it to be too low of a tide for what we had in mind. Thus, we stayed home. It was one of those warm, sunny Fall days. The wind didn't blow. As I wandered through the fields with a berry bucket in hand, I plucked a berry here, a berry there. I fed one to Rev, one to Kilchis, one to me, and then two in the bucket. The best ones were all above my head. The end of the picking season is near. I somehow have been too busy to fill my freezer, and now the picking is tough! Along the way I stopped to think a bit more about my pleasant boredom as I inspected our "Milton Tree'. It's a small evergreen that was given to us at Milton Fisher's memorial service. It's three feet tall or more, now, and stands tall and proud. It was totally without movement. Talk about boredom! The only fun this tree has is a bit of wind! A breeze! And can you imagine the biggest thrill to it would be a wind storm? When I got back in the house, Bill was making bread. We chatted about it, then about fishing, then, out of the blue, he said to me, "Oh, by the way, we have a problem." The tree was about to have a wind storm. "Yes, Bill? What kind of problem?" He said this as calm as the day, as still as the tree. Yesterday I opened the freezer to find my food just a touch "mushy". Upon inspection, it was really frosty, and I thought that the door was not completely shutting. Maybe the kids had left it open? Maybe it was just the building frost. Regardless of reason, I began the terrible and cold task of defrosting. It took me till late in the night to finish it, put back the food and shut the door. "Bill! It's not working!? Why didn't you say something?" I was in a panic. All boredom ceased! I ran to the freezer and sure enough, pure sog! Oh no! I was panicked! I tend to buy in bulk when there are sales. Bulk hamburger, steak, pork chops! That's money! Alot of my money! I was heart broken, and frankly, fear washed over me. I can't replace this! I'm not made of money! Anyhow, it was pure panic and no boredom at all for several hours until Bill came home with a brand new freezer. We had gone through a frantic couple of hours calling repairmen, looking in the paper for used appliance dealers, or offers in the class ads. This morning, I had to rise early. I'm going to take Bill into the hospital for surgery on his hand. It's not a big surgery, but it's not boring, either. I'm saying my prayers for him. Surgery is never fun, and our fishing will be further delayed, again. The other day, Bill brought home a pretty new washer and dryer from his Mother's home and I get to use it! It's beautiful! It's pure white! Before using it, I pet it. It was so smooth! So perfect! Years ago, I bought one all by myself when I was newly single. I had been so proud of it! So proud of a big purchase, paid all by myself with my own money. But, over the years, it's become scratched and dented, and as all things coastal, a growth of rust invaded every scratch. Bill is forever worried about the boys not cleaning the lint filter. I walked in the laundry room to find that he had written, (in black permanent marker!!) on the dryer lint drawer, "Please clean filter!!!" BILL! You wrote on my dryer? I was so upset! Men seem to think things like this are totally utilitarian, and don't see the beauty in their newness.. They are beautiful appliances! All clean and white and pure! He wrote on it! Can you believe that? Well, he without doubt, now understands that I did not like that, and he bleached it until it disappeared. My pretty white washer and dryer are back. And now, I have a pretty white freezer, too! After I had loaded it and shut the door, I turned to him and sighed. We were both so tired! I got out a piece of paper with tape on it, and stuck it to the freezer door and wrote on it. "Please, remember to shut the door, tightly!" "There, Bill! Now, that's how to write notes on appliances! Not on the paint, but on the paper! I'm looking forward after this morning, to returning to a little boredom. ...and maybe a little fishing. It is about time! There is a certain sweetness to sameness, a beauty in boredom, and a pure joy to unblemished white appliances! But most of all, there is nothing like the excitement of a Fall chinook on the end of your line, and I can't wait! This is an event you can't afford to miss! Join us for a Tribal Salmon Bake! It's free! There will be a raffle with framed prints, BBQ, waders, rods, reels, videos, hats, signed copies of "The River Why" by renowned author David James Duncan! -and much, much more will be given away. Bring your blanket to sit on! We'll have music and booths and you won't want to miss a minute! Most important, if you want decision-makers to get an eyeful of what you spend on your boat motor and trailer, join Buzz Ramsey, Liz Hamilton and others at the Willamette Boat Launch @ 4:00 PM. We are doing a boat parade to Sellwood (short distance across and up river) The first 100 boats will receive a signed David Duncan book! NSIA will provide watchers for the boats as you beach them on the N.E. side of the Sellwod bridge, so you and your family can enjoy the fun. Hey! Kids get the raffle tickets, too-- just for showing up, so increase your family chances to win and bring the whole family to fight for our fisheries! No Boat? No Problem!! Meet us at the Sellwood Riverfront Park at 5:00 for David Duncan, free food, music, and door prizes. Join us in a "Celebration of Salmon" and a rally for action - featuring fisherman, conservationist and author David James Duncan (“The River Why”) and leaders of the Northwest sport, and tribal fishing communities, including Rebecca Miles, chairperson of the Nez Perce tribe, Jennie Logsdon of Ifish, and legendary salmon and steelhead angler Buzz Ramsey! WHY: Our Fisheries are being managed out of existence! Show up, be counted and sign up for our action network. Our Government needs to know that we demand healthy salmon populations and meaningful salmon fisheries. WHEN: Tuesday, September 19th Boat Parade begins at 4 pm at Willamette Park. WHAT: Join us for a celebration of Northwest fish and rivers featuring food, family fun and straight talk about the failure of leadership to restore and recover wild salmon, and protect our fishing heritage. For now and for future generations, help send a message to our elected leaders that extinction stops here, with us. Free Tribal Salmon Bake sponsored by the Warm Springs Tribe. Prizes provided by: G.I. Joes, Seasonal Marketing, Clackacraft, Country Sport and NSIA, the Association of Northwest Steelheaders and more! First 100 boats that arrive at Willamette Park to proceed by river to Sellwood Riverfront Park will receive a copy of “The River Why” signed by Author David James Duncan. All who RSVP to 503.631.8859 will be placed in a raffle for a signed print, “MYTH” donated by NSIA and ANWS. For a map and detailed event information please visit www.nsiafishing.org. It’s Time To Take Back Our Rivers And Our Right To Fish! I am going crazy, lately trying to write or compile something to say at the Salmon Festival, on Tuesday. It would seem simple enough, wouldn't it? Just write down something and say it? In high school, I won several trophies in speech class for dramatic interpretation. I was good at it! Really! Where did it go? I'm not meant to be in public. I'm meant to stay home, by my river, watching the comings and goings of different species of fish. I'm meant to fish in my pajamas. When I have that opportunity, words flow from me with virtually no effort. Music comes out of my fingers without my trying. Put me in public and I'm just ruined! And so, I'm going to walk out onto the river now and scream! In my robe! I think me head is going to fall off the top of me shoulders. It's one of those migraines coming to knock on me noggin'. It's knockin' hard. It will go away. Give me a couple cups of coffee and an aspirin and I'll be good as new. I've pretty much finished what little I'm going to say at the festival. It really wracked/wrecked my brain though, to write it. It was more difficult for me than writing a symphony! I think that reciting will be more difficult than playing one, too. How I wish that Liz would change her mind, and tell me that she rented a grand piano, and would I please play for the crowd, instead? I have so many river songs that I've written. It would be perfect! I'd so much rather play than speak. I get lost when I play, and the audience always slowly blurs into no one. That is, until the end when the applause starts! Then, I have to agree, usually. "That was pretty good!" You know, though, sometimes after a huge performance like at the White House, or for someone I really was intimidated by, I would get these terrible migraines. But an outdoors concert for fellow fishermen? I would adore to play river songs! They could relate! They could hear all of the sounds that a river makes, for me, and the feelings that we all have in common, when out on the river. I've purchased a small recording device that I record certain passages by voice when I'm on the river. It really helps me! I used to quickly go into the house, play it, and then write it down. Sometimes on the way, I'd lose the melody. Well, now that I can't walk as well, or as fast, it's almost a sure bet that I won't make it to the piano. So, I just turn on the recording device and sing it. Then, I can relax and let other things come to me as well, instead of hurrying along. The river is full of music, no matter what the river level. From the silence of a sweet lullaby in the spring, to the full symphony of a winter's high water. Listen. Really listen. Next time you are on the river. Listen! Each day I've put off fishing so that I could finish writing something silly for this event. Today is the day that I can go, and now my head is out of order. Frankly, I was right. I've now had a cup of coffee and an aspirin, and I think it's almost gone. I'm a little afraid to shake it to make sure! Maybe... Maybe I should go? I'd love to hear what the bay has to play, today. I'll give it a few more minutes to see. Meanwhile, I'll finish my ifish mail and get the dogs another treat. You have no idea how cute these two dogs are, together! They are fast friends, now. They sleep together, play together, and steal each other's treats when they aren't looking! Last night we celebrated David's 18th Birthday. You know, maybe that's why I have a migraine. My babies are all grown up? After a whole lot of debate, he allowed this one photograph. Since it's only one, you may click on it, to make it bigger. I didn't ask permission for that, though! And, I'm sorry, but no autographs. Yeah, I tried really hard not to make anything of it, but I couldn't help but cry as I read all those mushy Hallmark cards. How embarrassing, to be in the local safeway card isle, sobbing! He's still my baby, though, and so is Roo. Andrew went to hear Amy Goodman, host of Democracy Now!, at the Bagdad, yesterday. At 19, although I don't agree with all of his opinions, it's good to see that he cares, that he's forming them. He took a bus all the way there, just to do this. I like that! She wrote a book and Roo had it signed, there. The book is "Static". OK, I'm off. My headache is now gone. I guess that's good enough permission to go fishing, for me! This makes me cry each time I see it. My friends! This is ifishstock! Join us! Linda from ifish was nice enough to record this and Andrew, my son, uploaded it for me! I love it! Fished the Ghost Hole yesterday and it was just that... a ghost hole! No fish, very few boats! Still, I had a wonderful time, and the salt air is still in my hair. I have to pack and get out of here, this morning. Shoot! And, it's raining cats and dogs! I'd so love to watch the river rise and wait for that first salmon over my riffles. I hope I don't miss it! I'll still be around a bit, (on my laptop) but please be patient if I don't answer all of my e mails! See you at the Fin Fest! One thing that is very good! I feel better, today! I have so much to be thankful for, and I spent the drive home thanking Him. Everything I noticed, I said thank you for. It was really therapeutic! Man, there are alot of blessings surrounding us! The closer you get to the coast, they start coming faster and faster until it's just one sentence! ...and Father? Thank you for the green and for all of the colors... and the rain.. and the river, and the waves, and the fish, and the green-tree-spring of mountains....and for the blue-true-dream of sky and...! I started to giggle and by the time I rounded the last corner, I was laughing. I think He was, too. Ever have a good laugh with your Heavenly Father? It's fun. I'm sure he laughs plenty at me and my follies, but to laugh WITH Him, now that's good fun. ...and Father? Thank you for my work! OK, I'm caught up with e mail, at least. You know what really helped me to get through the speech? Well, two things. I was feeling like making a mad dash at one point. I was so nervous! Before I knew it, a nice gentleman came up to me that had no voice. He had difficulty getting me to hear him, so he used visual aids as he tried to communicate. His name was Gus. He had no voice due to cancer, and a resulting surgery. He works very hard for the kids at Camp Angelos. It struck me. Here I was, not wanting to use the voice that I had been given, and that I take advantage of, every day, when others have no voice. That did it. I was speaking for the salmon! There was no doubt! And thank you, Gus! It was lovely meeting you, and I will be in touch! Thank you, Father, for things I take advantage of. My voice, my sense of touch, my eyesight- however feeble, so many things we never stop to appreciate! I couldn't sleep last night, so I read. At 2 in the morning, I read! At 3, At 5! I read from "The River Why". I think about it differently, now that I've met David James Duncan. I love books. So many life experiences put different lights on them, so they are ever changing and yet familiar, and all the same. David Duncan? What a jewel of a human! What a precious man! God, you did really well with that one! I am honored to have spent time with him. I got to ride over in a boat with him! I got to reach out and touch him! Funny thing, I expected to be frightened to meet him. He came in a car with Bob Rees. You know, I just love Bob and his wife. They are deep down neato people. David was in the car with Bob and as they crawled out of the car, I recognized Bob. I smiled and greeted him warmly. I wasn't even aware of who else I was meeting at the time! So, it was very casual and relaxed. I was introduced to him. "Jennie, this is David"
"Hello, David, nice to meet you!" I smiled. Later, it hit me, Ohmygosh... that's David Duncan. You know, Jennie, that David!!! Aftershock! I even thought to myself, "Self? Did I name my child after this David?" I've never figured out why I named David that. Was it because of my brother, David? My boyfriend David? Biblical David? Or this David? Perhaps a combination of good Davids throughout my lifetime! Back to the subject of relaxing comfort... That's the thing with that events entire group of folks. I've never spoken in front of 750 people before, but standing behind the pedestal, I glanced around the crowd and I saw friends all around me. Friends who have salmon in common. That's a recipe for comfort for me; Comfort and hope! We all care so deeply about something so very important. The thought of losing salmon brings me to tears, even now, as I sit to write. I shook David's hand and felt instant warmth. He is warm, caring and kind. He cares for salmon, so much! That's pretty much what I thought I'd find, but still, I was nervous thinking about greeting him. So many years of holding someone on a pedestal will do that to a person! I just adore his writing. As I read through a chapter that I'd read a hundred times before, I found myself putting him back on that pedestal. The man is brilliant! How could he also be so real? So normal? So warm, kind, and comforting? I think it's because we have salmon in common. I dislike it and warning bells go off when I feel like someone is putting me way up there on a pedestal. It's scary. I know that I'll do something that will cause me to come crashing down. I do that regularly. It's part of my act! I'm so darn human. I fail. Then, the person usually tends to be so disappointed that I'm not what they thought me to be that I'd have been better off if they hadn't thought anything of me at all! All I am is someone who cares about salmon. Remember that, alright? I also read from "King of Fishes" and Dave Hughes "An Anglers Astoria" for a bit. I heard through the grapevine that he was present the other night. I would have doubly been thrilled to add him to the list of people I've met. I adore that book! Plus, an interesting relation; I had Dave's Mom smoke salmon for me for years, when I lived in Astoria. I'd give some to her to keep, if she'd smoke mine. No one smoked salmon like she did! Oh, I remember picking it up, warm off the smoker! Oh, yum! I have fished with his Father. My friend and fishing buddy, Ben introduced me. They were old time friends. I just loved them all! I do wonder how both of them are, and I'm almost afraid to ask. One day Dave's Father sat me down on the living room couch and began to tell me about his son, the great author. I thought he was talking like any proud Father would, and I nodded in agreement. I had no clue who he was referring to, and how! Years later, I was reading a Dave Hughes book and the association hit me. NO! No way!!! Yes way! (laugh) It was he! I nearly fell off my chair, when I put it all together. We all have salmon in common. All of them. No wonder I call them friends. I don't know why I can't sleep. Too much excitement. So much aftershock. I've been fishing quite a bit. Fall has hit me like a ton of wet leaves, this year. Usually, I take time to see it coming. One late summer evening or morning in August, I'll notice that the air has a hint of Fall in it, and I usually exclaim it out loud. I didn't this year. This year, I didn't even detect the early signs, and all of the sudden, right now, it's here! Yesterday was summer. Today is Fall. My garden is dying back. The colors of the fields surrounding me are golden and almost winter like. My raspberries are finally ripening. (All 11 of them!) but they lack the sweetness of the sun. I'm finally harvesting a few squash. My tomatoes, again, are not going to ripen in time. The air is cold and damp, and it would be no surprise to me to see a salmon in the Kilchis. Where did the expectation go? I love the momentum building up to my favorite season! I guess I'd better just jump right in the leaves and start throwing them around in joy, because, ladies and gents... Fall is upon us! On the way home from Portland, I was rounding the last corner towards home and a golden leaf came twirling down at my car. I watched as it approached but was totally surprised as it hit me squarely on the windshield, right before my eyes! And that is how I was introduced to Fall! Get out your sweaters and rain gear, folks! Fall is here! I wouldn't have known it, until it hit me square in the windshield! I am in deep gratitude to Liz, who gave me a sack of fresh garden tomatoes! I haven't tasted anything so wonderful! When I got home, I prepared a meat and potatoes type meal for the guys; and me? Well? I had a plate of sliced tomatoes! Thank you! So good! So, so good! It's Harvest time! Where's the moon? Aftershock! It is certainly all catching up with me. I just wish it would hurry up and balance out. I really could use some sleep! This morning it was dark when I got up, and I took the dogs out to do their duties. By chance, I looked up at the sky and it was chock full of stars. It was so beautiful! What was even neater, is that I had no glasses, contacts on, and I could still see stars! I have a thing about stars, ever since my son who was blind at birth, had his first eye surgery, and the first thing his brain taught him to see with those new eyes, was stars. "MOM! There are stars in the sky!!" I'll never forget that, and the excitement I felt. If you want to read about it, the story is here. Scroll down to Chapter One. And so, today we move on to "All my eye surgeries" Chapter bazillion. Last I left off, I was scheduled for eye surgery and well, the date of the surgery I was in surgery for an aortic dissection. I'll not forget Bill canceling the appointment, or telling me that he had, after the fact. You know, I really don't see why it was cancelled. As long as I was out with my chest open, I might as well get other things done. You know, eye surgery, perhaps wax my legs? A new hairdo and a pedicure? Come on, doctors! Get with the program! So, it is with a little bit of worry that I drive to my appointment, today. What will happen this time? I'm not in the mood for heart surgery! That's for sure! Thing is, if I don't get my eyes fixed, soon, I will have to give up my driver's license. I can feel that coming. My eyesight is not getting better, and darned if I don't feel like it's getting worse. But... I could see those stars! I almost fell over, gazing at them in wonder. It is indeed Fall. I spent the other day on the bay, and watched a few fish get caught. The pandemonium of the salmon season is upon us! Usually in Tillamook, 1/3 or so of the trucks are pulling boats, but this time of year they are everywhere! Everyone is pulling a trailer! Everyone has rods in their trucks, cars, etc. It's like a festival, every day! 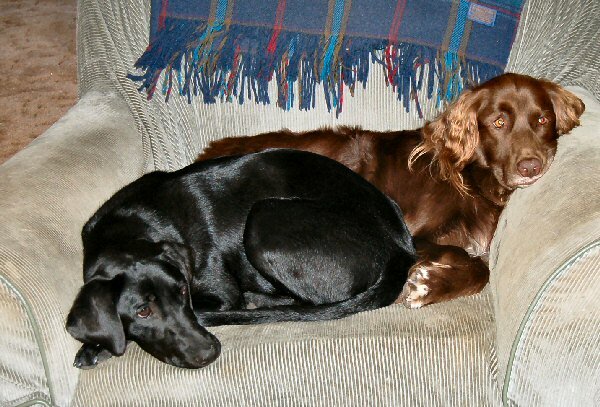 I have to tell you that Rev, our new black lab is still causing a bit of havoc on the Hedlund farm. The chickens don't get let out, anymore. No more Bette at the back door, begging to get in to clean our floors for us. 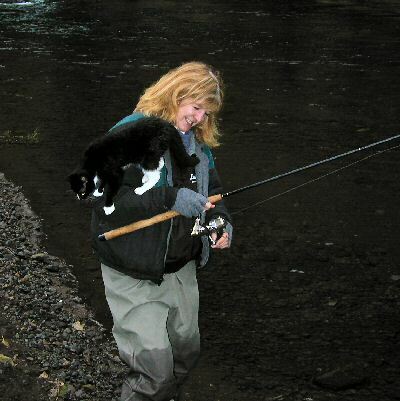 The cat cowers, and won't go down to the river with me to fish. If she does, she's chased, straight away into the woods. It makes me sad. What once was a peaceful life in the valley is now frozen in terror. The big, black lab will come out and getcha if you aren't careful! Poor Kilchis. He hovers next to my legs. Rev has this way of running from the other side of the field at full blast, and just body slams Kilchis until he's on the ground. Kilchis has walked with a limp for weeks, now. I think every time he starts to get better, Rev fixes that! Truth be known, I'm' having trouble adjusting. Bill is still holding onto the hope that it's just 'puppy', but I'm ... having trouble adjusting! Bill's solution is to put her in the pen, and I just don't think that's teaching her to live peacefully with us. My hope is that she'll grow up and lose a little of that ambition! She's a bundle of energy, and really, so cute when she's on the river and playing, but... for all the terror! Look out! If you come to visit, watch for that speeding black bullet coming at you from the bushes! She'll knock you flat in no time! Well, I'm off to the big city. Wish me luck. I've decided not to make a decision on my eyes and what surgery should be done. I'm just leaving it all in the hands of the good doctor. Do what you will, doc! My eyes are all yours! You should see how the morning sunshine is picking up the yellows and reds and golds in the trees, this morning. It's truly Fall. Tissue paper. It keep crossing my mind since I woke. One, is how 'apt' my nickname was, as a child; "Tissue pae pae". It rolled off my brothers and sisters tongues in a sort of fake french accent, you know. I was delicate. I guess I still am. Anyhow... this is how the story goes. Another chapter in the saga, "All My Eye Surgeries." -Or how bout, "As The Eyeball Turns?" I visited my surgeon yesterday, to see what I could see. Last May I left off with Dr. Mathers saying that he would visit with my old surgeon, who last worked on my left eye. He said he would get back to me. That last eye surgery didn't go so well and when I inquired about having it 'fixed' my old surgeon said, "Jennie, not only do I not want to do surgery on you again, I loathe the idea. Your eye fell apart in my hands!" Ish! But, that's what marfan tissue is like, I guess. It's like trying to sew a sponge together. It just keeps breaking through. It's no fault of the surgeons. In fact, he is a very good and respected surgeon. He is now the head of OHSU! His name is Dr. Joe Robertson. He fixed my other eye and he brought my son Andrew from total blindness, to sight. I hold him in high regards. The surgery he performed 3 years ago on my left eye began with taking my lens out. --and everything else. I had a vitrectomy. He then put the lens in the capsule in front of my eye. Therefore, there was no need to sew it in like he had in my right eye. My right eye has one sewn into the back of my eye. (With mono! I love that! I wonder what pound?) I'll never understand why he did it differently this time... but I'm not a doctor. Anyhow, turns out the lens was too small, and in the end, it just wasn't successful. I had traded one dislocated lens for another one. The IOL he put in (intra ocular lens), being too small, bounces around and irritates my cornea, which is already delicate. (Tissue pae pae, you know!). Also, during the surgery, my pupil was torn, so it lets in too much light, and I see duplicates of things. Up to four times, sometimes! Now, that's fun! Especially when I have a big fish on! I'm known to yell, "Bill! I have four fish on!!" That is so cool! Not many people can do that! But, I have been having trouble wearing my contacts for the last year. It hurts! Well? That's why! My cornea is "pae pae!" It's good to find out why. It was very frustrating to me. I am more than legally blind without them. When I drive, I just put them in anyway. Pain or no pain, I have to drive and I have to SEE to drive. People like it when I can see, while driving. Yesterday, after tearing my contacts out, the minute I got into the office, Dr. Mathers said that I need a corneal transplant. Actually, in both eyes.--But we'll start with the left. The left one has been bothering me lately. For the first hour or two when I get up, I can't see. That's why. So, if I want to... if I think it's worth the chance, if my aorta is stable... here is what we'll do. Then, they'll go into the back of my eye and sew in an IOL onto the sides of my eyeball. I have no muscles to hold it in, so they sew it in. THEN, they'll stitch that up (real tightly, please!) and see about the corneal transplant. Thing is, they are doing a new, much easier corneal transplant these days and it won't be that bad, I guess. Of course, there is always danger in these operations. There is a chance something will go wrong with a normal person. With marfan, it is extra tricky and critical. I wasn't happy to hear about my cornea, but I swore I wouldn't cry about it. It was rather shocking, though. I mean, I went in to find out about my lens. I thought it was a fairly simple thing. I had no idea that corneas were weak on people with marfan! I had no idea something else was significantly wrong. That came as a total shock to me! I really didn't need anything new. First thing out of there, I thought, "Ice cream!" I needed ice cream and I need it badly. I was given 10 dollars worth of Baskin and Robins ice cream certificates a year ago. They were still unused! I drove into Baskin and Robins and got two quarts and some dry ice for the drive. Jamoca Almond Fudge and Pralines and Cream! Ice cream heals all wounds, doesn't it? I think so! I was pickled tink! I was thinking about staying over, but I was too bummed. I called my sis and luckily, she wasn't home. She makes me cry when I tell her things. I left a message. In the message I bravely explained my dilemma and stated, "I'm not going to be wimpy." I called a friend, and mostly got through that conversation, too. By that time, I was nearly at the end of the cell zone, and headed up the mountains, back home. I thought, "Oh boy! If I can get past the cell zone, maybe I can cry all by myself and no one will ever know! There is nothing like a good cry and ice cream! All of the sudden, my phone rang. It was my sister. I got through one sentence and just totally broke down! "You said you wouldn't do this!" Teri said. I laughed and dried up before the conversation ended. I did alright all the way home, too. I stopped to half heartedly search for chanterelles. Mostly, I just enjoyed the bright sunshine and the smell of the old growth forest. Beautiful purple flowers hung from one tree and it totally memorized me. I love to see! You have no idea! Now the time has come to decide. Do I want to fix my eyes? Do I want to continue to see things as stunning as those purple flowers? -Or the meadow that stretches out before me, today, lit with golden sunshine that tips the trees? I do think I know what the answer is, and it's clear that if I don't do something, my vision will gradually fade. But if I do schedule it, when? When in between fishes is good? You know, actually... I'm really getting tired of seeing four salmon, when I only have one. It's really a drag, too. My tag fills up awfully quickly that way! I think I'll do it. I just think I will. I was feeling kinda sick so I took a nap. "HEY JENNIE! THE BOARD IS DOWN!" So, there I was... lounging in the sunshine, drinking ice water and reading the new STS. This is never good. Mid day, Pete is at work. Never a good sign. "Uh huh... The board is down. Looks like it's been down since 1:00 PM." Argh. I could have been nicer to him. After all, he let me know that my beloved ifish is down. But no, I just said, "Alrighhhhhhhhhhhhhhht..." I hung up, and went into the comp. Sure enough, things are down. I've written to both techs and I'm waiting to hear back. They both live in Germany, so it's not like I can just call them! Besides, it's their night time. Or, shall I return to the sun? Oh! How I wish I was that type of personality! No, I sit and worry. That does me alot of good, doesn't it? I am truly sorry. I have been battling the servers and trying to get out of town people to work on ifish bulletin board to get it back up. I have had no luck, after hours and hours of trying. It looks to me like we ran out of disk space. Our server admin is out of town. My head is killing me. I will try again, in the morning. I fell into bed last night, weeping with fatigue. I held my dog, Kilchis, close. He lay on top of my chest, while my mechanical valve clicked, noisily. It didn't bother him in the least. The softness of that 'kiss place' (right behind his eye, you know?) stayed close to my lips. It was wonderful falling asleep that way. How many kisses before sleep came? Not many. Thank you, Kilchis. He ordinarily wouldn't stay there, but he sensed that I needed him like never before. He held unnaturally still, while I dozed off. Go away, thoughts and fears, go away! I did sleep, last night. I slept hard! I was amazed by that. Usually, if ifish isn't working, I can't rest. But, it had been 10 hours of frustration. I slept! The night before last, just at sunset, I had been delighted by a river full of leaping cutthroat trout. It was utterly amazing. You wouldn't believe it! I had reached that point of frustration that every fly fisher feels from time to time. I hadn't had a take in ages. Cast after cast proved the wrong fly, as those wily creatures laughed at me. I'd strip it past their wittle noses and I'd hear them giggle. "Close, Jen, close!- But, I'm not buying it!" When I hit the garage, I spied my kids old trout rod, complete with a killer yellow Roostertail tied haphazardly on the end of fairly heavy mono. I grabbed it with abandon. It was dusty and rusty, and the real turned with a groan of resistance. I took it anyway! It was my Grandfathers trusty Mitchell 300. I love that reel! I was desperate for a pull. Any kind of pull. I need contact. I cast, and I cast, and I cast. There was a trout jumping in the middle of the pool. I thought surely someone had harmed it, upstream. I expected it to jump and see mono hanging from his gaping mouth. You know how fish jump repeatedly, when they are dying? I was ticked, thinking someone had hooked one of those holy fish, and harmed it. But, the more I cast, (without a tug!) the more often this "fish" jumped. Wait a minute... I stopped my cast and studied my surroundings. Sometimes we don't see. Sometimes we don't really look. That isn't just one fish! That was several fish! And those very several fish were taking October Caddis! The large clumsy flies were as thick as a late winter snow, falling wetly onto the water during a warm blizzard. Each time one crashed like a dizzy helicopter onto the water, "Spallooooosh!" And me with my Rooster Tail! So, I stopped the casting and plopped myself down on a soft spot of grass to watch the show. Everyone knows that it is premier week for television, but this was by far the most exciting half hour special broadcast, and it wasn't even advertised!! I had never seen anything like it on the Kilchis River. Earlier in the week, I found a beautiful cutthroat trout laying belly up in the warm shallows. It was nearly 20 inches long and fat like a well stuffed turkey. The poor thing was covered with some kind of fungus, though. I worried that perhaps this might be affecting all cutts, and I considered leaving it there to call ODFW and ask where all the cutts are, this year? During the pinch period of late summer, the river looks so unhealthy. But, Rev was overly interested. I threw it in the deeper water to protect her, or at least stall off the possibility of salmon poisoning, which is sure to come this Fall, anyhow. I don't even think dogs can catch it from trout. I don't think so. Still, I threw it. Spaloosh! But last night, I was amazed by this show of searruns, because I was convinced they were of low numbers this year, if not totally absent. But no! They were simply awaiting the October Caddis, as eagerly as we await our Fall harvest! The water was glassy still, except for the movement of fishes. Every time a trout moved, or surfaced, or leaped toward the hatch, the water mirrored the movement. In water, for every action there is an exaggerated super reaction. The surface water marked and amplified their movement in a beautiful water ballet. I could see in my mind's eye exactly what was going on, beneath! I was dazzled. It was the most incredible show I'd seen on the Kilchis river, or anywhere! And me, without my fly! At the close, an indescribable wash of Fall colors painted the sky, followed by complete darkness. As the curtain closed, I was left sitting, even as the sun slipped behind the mountains, utterly speechless and motionless on the wet grass. "Someone pick me up!" I thought to yell. But even if I had, no one would have heard me. I was as alone as I was the day I landed that 20 plus pound lifetime steelhead. I wonder the same thing. No one will believe my story of the leaping cutthroat, just as they doubt the size of the fish I landed,. These were two very enchanting evenings, and I owned them. These are the things that are my very own, personally, and I lock them away in a closet, protected from all doubt. I can only hope that I can leave my children with a wonder for the water and a love for the fish, that will enable them to inherit these things that I love so dearly, someday. Thank you for letting me lose my worry long enough to tell you this story, and to share with you these things that you won't believe. Last night, I wanted nothing more to go down to the river with as close an imitation to an October Caddis tied to my fly line, but the board kept me from doing it.